I love the spirit of giving that fills the holiday season. 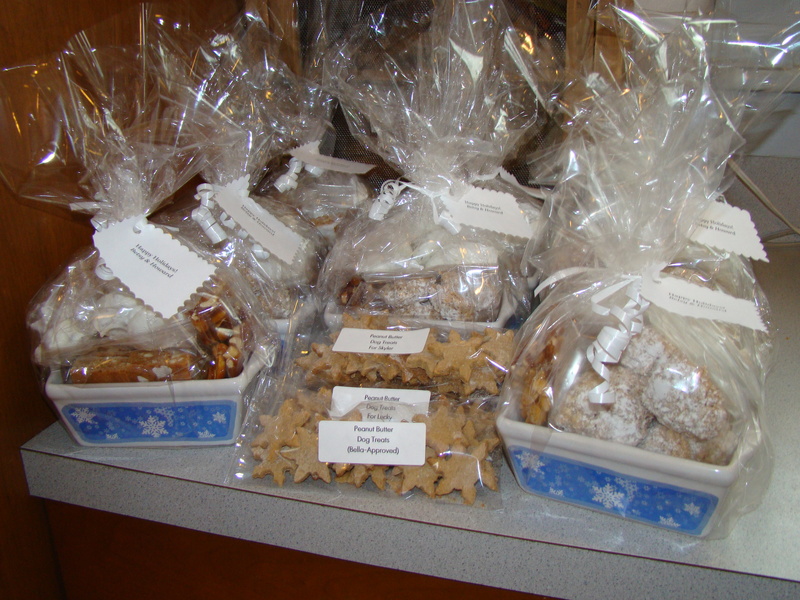 For many years, I have baked and made candy and made small packages that I deliver to my local friends and neighbors to wish them Happy Holidays. I have a few standards but mix them up year by year. I also usually try to something new. I was on hiatus from my winter packages for the past two years. Two years ago, I was not very mobile, either at home or away from home, as I recovered from surgery to repair the rupture of my Achilles tendon. At the end of December last year, we went on a cruise of the Panama Canal with Howard’s sister’s family. I wasn’t quite organized enough to make it happen. So after a two year break, I restarted my tradition. Last week, Howard’s co-workers had a holiday dessert party to end the week. He made the star dessert from his dessert repertoire, a double batch of Pots de crème (from Cook’s Illustrated). That meant we had 10 egg whites in the refrigerator, so I wanted to try to use them in what I made. A partial answer arrived by email. I signed up for a daily cookie email from Real Simple magazine. The recipe for December 18 was for Chocolate Chip Meringue Kisses. A double batch would use 6 egg whites so those went on the list. I remembered making amaretti cookies a few years back. They were chewy and very almond-y, sort of but not exactly like the almond macaroons you get at an old-fashioned Italian bakery. The recipe called for 4 egg whites, so I was all set. Basler Leckerli were a definite must this year. These are a Swiss honey cookie that I was introduced to by my friend Laury. Her father had them sent from Switzerland every year. I always enjoyed when she shared it with me. They are slightly chewy from the honey, citrusy from candied orange peel, and nutty from chopped almonds. Many years ago, Gourmet magazine printed a recipe for these cookies. I tried it and according to Laury and her family, they are pretty authentic. Even Howard likes them, and he normally wouldn’t eat a cookie with dried fruit in it. So they have become an almost annual standard. I have to say how much I love the physical act of making these. After you mix everything into the warm honey mixture, you pat the dough into the cookie pan. It’s warm and spicy. Every time I make this recipe, I comment to whoever is in the kitchen about how much I enjoy this step. It’s so tactile. It feels so comforting to pat that warm dough into the pan. To round out the assortment of baked goods, I made some peanut brittle. As I mentioned in another post, molten sugar is a scary thing, but worth it. Again, Mark Bittman gave me the confidence to melt the sugar for this two ingredient Peanut Brittle. It’s just sugar and salted peanuts, nothing more. I remember watching the video two or three times before I made this the first time. He makes it look so easy. Before I start, I butter my marble pastry board. When the molten brittle is ready, I pour it on the marble board, spread, and wait for it to cool. It’s dark and crisp, with a slightly burnt caramel taste. Some year, I’ll try it with other nuts (my sister Jane makes brittle with pistachio and sometimes cashews). Last year, my sister Jennifer gave me a dog biscuit cookbook. So, as a final touch, I made peanut butter dog biscuits, in snowflake shapes to celebrate the season. I added a pack of these for my friends with dogs. They had the Bella seal of approval! Preheat oven to 325F. Line the bottom and sides of a cookie sheet (approximately 10½-inch by 15½-inch, with sides) with foil and butter the foil. In a bowl, whisk together flour, spices, baking powder, and baking soda. In a large, heavy saucepan, heat honey and sugar over moderately low heat, stirring, just until the sugar dissolves. Remove the pan from heat and stir in kirsch, orange peel, and almonds. Stir in flour mixture and cool dough for 5 minutes. With well-floured hands, press the dough evenly into the cookie sheet (this is my favorite step, as mentioned above). Put dough in the oven and immediately reduce oven temperature to 300F. Bake dough 25 to 30 minutes, or until firm but not dry or hard. Cool in the pan on a rack. Invert baked dough onto a cutting boards, remove and discard the foil and turn back right-side up. In a small saucepan, heat the water with granulated sugar over moderately low heat, stirring, just until the sugar dissolves. Sift in confectioners’ sugar and stir until well combined. Pour the hot glaze over the baked dough and brush evenly over the dough, brushing continuously until the glaze crystallizes and hardens. Let glazed dough stand for 10 minutes. Trim off the edges of the dough (save for snacking). Cut the trimmed dough into 2- by 1½-inch rectangles.